Yay! 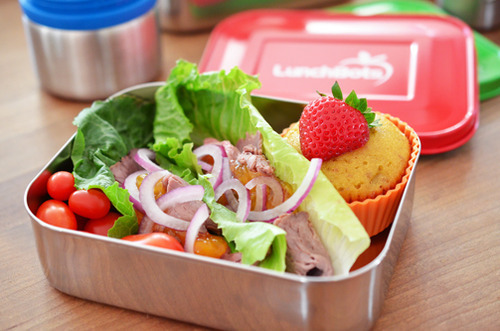 It’s the last lunchbox of the week! 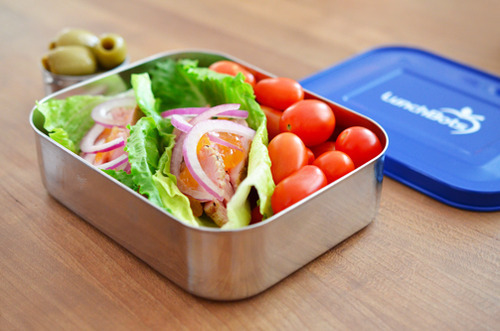 If you’re like me, the meal-packing fatigue is really starting to set in, so I made sure to keep this one easy-peasy lemon squeezy. For the meaty filling of these wraps, I cooked sous vide a pork tenderloin that I seasoned with Tabil seasoning. 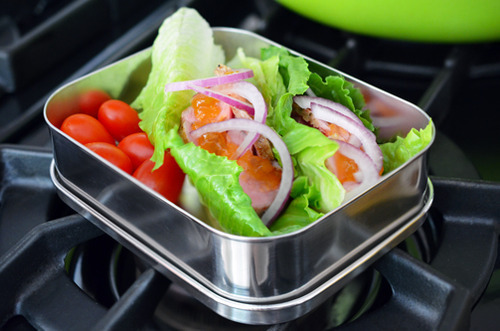 With the school year back in full swing, meal prep becomes more challenging, so I’m doing my best to keep a few pre-cooked loins in my freezer that I can reheat in my water oven for dinner in a pinch. 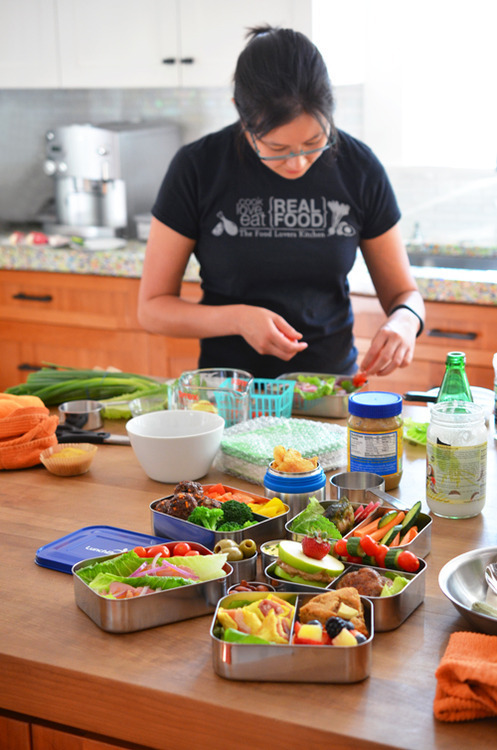 I know what you’re thinking: SOUS VIDE? But I don’t have a sous vide cooker! And I don’t want to hack my own! Aaaaaggggh! Chillax, gang. Ryan Farr of 4505 Meats (remember my interview with him?) 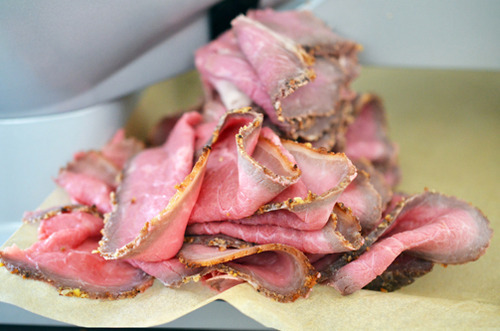 has an awesome slow-and-low oven roasting method for meats that works like a charm. Check out my description of it here. Still too complicated? 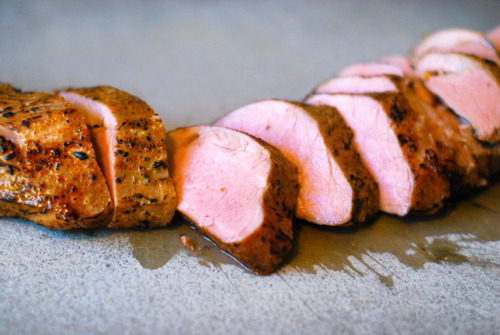 Use this recipe to prepare oven-roasted pork tenderloin. 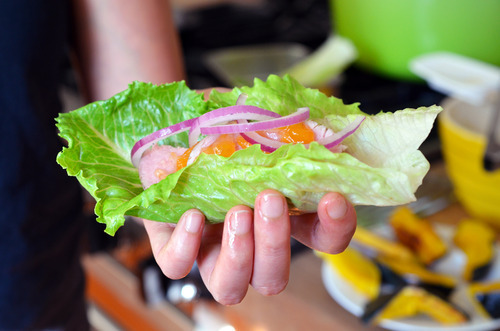 Leftover tenderloin is perfect for lettuce wraps or porkwiches! 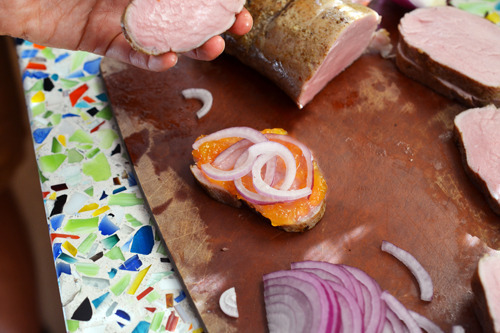 Personally, I think pork pairs beautifully with fresh peaches (e.g., Peachy Pork-A-Bobs); the savory-sweet combination is one I can eat over and over again. 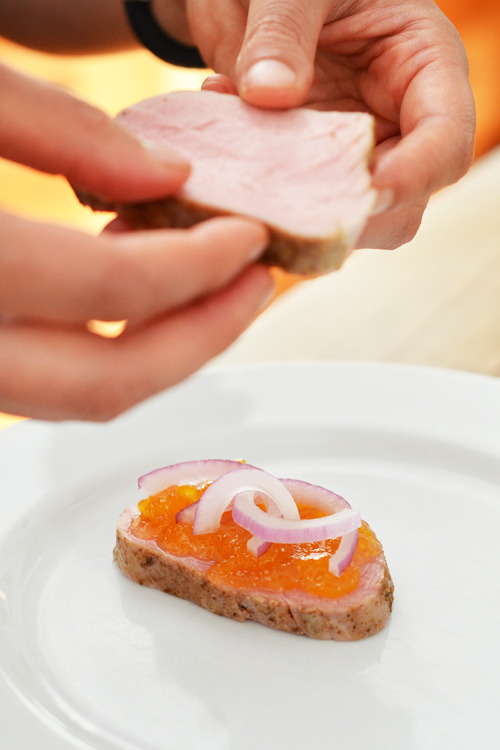 But if I don’t have any fresh peach slices on hand, I simply top the seasoned pork with a little fruit-juice sweetened peach jam, sliced red onions, a grind of fresh black pepper, and a sprinkle of salt. 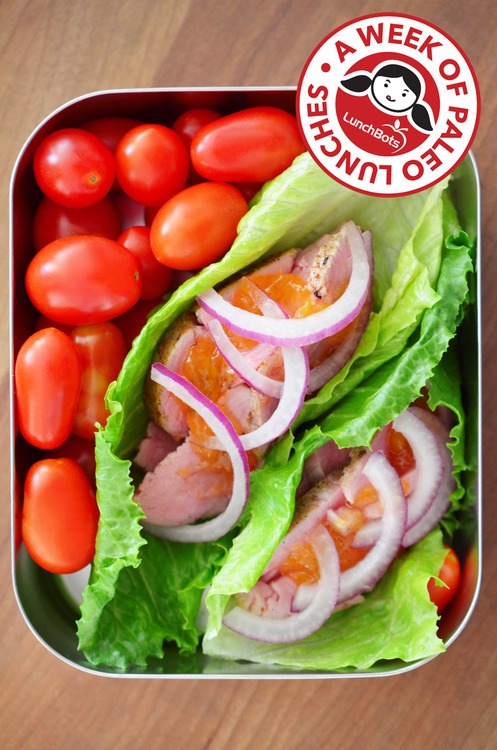 Toss in a few cherry tomatoes, add a little container of your favorite briney olives, and you’re good to go. No lettuce on hand? You can make a porkwich with the same ingredients. 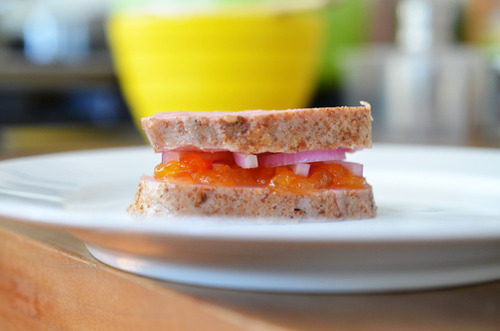 Here, the slices of pork tenderloin are the “bread,” and the peach jam and red onions are the filling. Don’t forget: Season with some salt and pepper to counterbalance the sweetness of the jam. What?!? No pork? Man, you’re really being difficult today. Okay: Plan B. 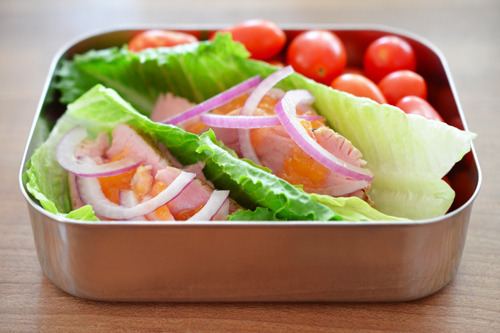 Fill up the wraps with your favorite deli meat or whatever leftover cooked protein you have in the fridge. 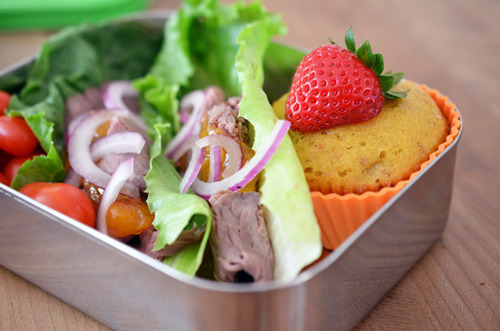 And if you like, you can include a mini banana nut muffin in your lunchbox. It’s the end of the week, after all. 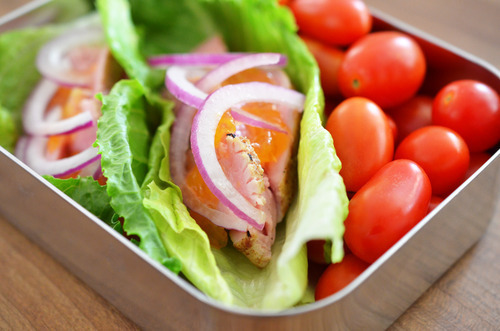 For more great ideas for lunches, don’t forget to check out Parts 1, 2, 3, & 4 and last year’s series of Paleo School Lunches. 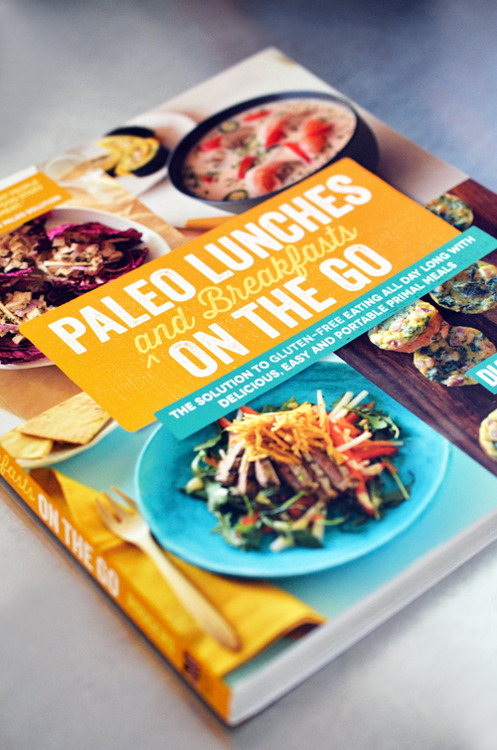 And don’t forget that my pal Diana Rodgers’s Paleo Lunches and Breakfasts On The Go is chock-full of fantastic packable delights. Stay tuned…I might have another surprise around the corner.